since when did goals become bad? This was a tagline of a contest advertisement by a sportwear company that I just saw on FaceBook. I can’t even begin to say how many problems I have with this sentiment. Since when are long-term goals a bad thing? Maybe this is meant to be tongue-in-cheek, an amusing twist of irony? If it is, they don’t do a great job of communicating that sense. When I see that, sarcasm and irony or not, the sense I get is promoting the idea of entitlement, instant gratification, and getting things handed to you without putting in the blood, sweat, tears, and sacrifice. Long-term goals are what separate out the boys from the men, so to speak. How willing are you to commit to something wholeheartedly? How much does it matter to you? What are you willing to sacrifice in order to get to that point? But to me, having big-picture, long-term goals is what defines endurance. Per Webster, endurance is: the ability to withstand hardship or adversity; esp. the ability to sustain a prolonged stressful effort or activity. 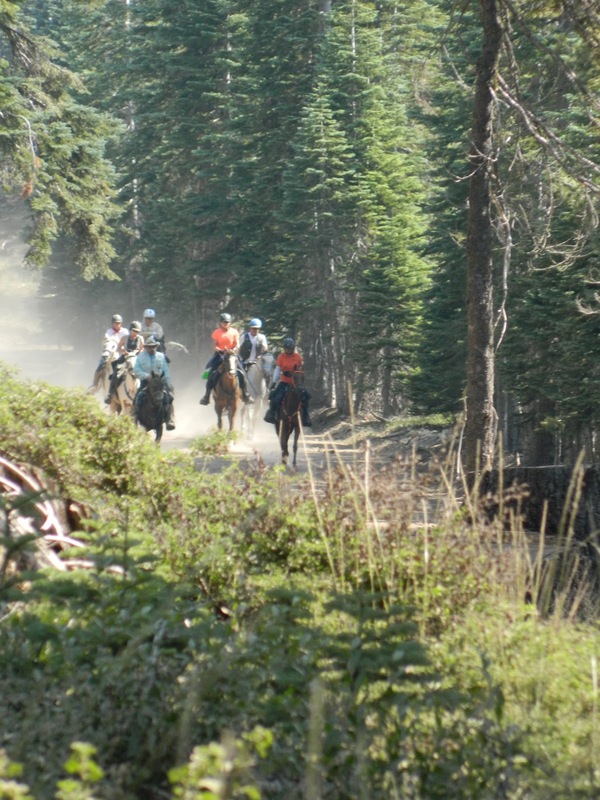 Endurance is what keeps people coming back to a ride like Tevis, year after year: they made a goal to finish that ride. Endurance is what makes people keep on working with a difficult horse, because they know once they have a breakthrough, the payoff will be more than worth it. Endurance is when people sacrifice other things in their lives — a teeming social life, frequent dinners and movies out, a new house, a vacation to the Bahamas — in order to follow their passion and goals, be it ending up in the year end points, racking up a certain amount of miles, or committing to spending as much time as possible discovering and sharing beautiful trails with a beloved equine partner. To me, having a long-term goal is what gives us the fire to make it through the challenges, the rough patches, and the times when it would just be easier to quit. Instant gratification has its place (such as being paid right away for a job), but when it comes to big picture, long-term goals, I’ll take the satisfaction and reward that comes with working for and earning that goal. vet check at the 2012 Tevis Cup ride. I love your attitiude! Methinks you learned well from your parents, perhaps? :) You will go far and accomplish much because you understand what it takes to get there! You go girl! Thank you! Yes, my parents were definitely the foundation for embracing this attitude:I couldn't ask for better role models. The only thing I can think of… they meant to ALSO enjoy today. Not to completely get rid of long term goals, but to remember they aren't the only thing that matter. Learning and living for right now are also important. Mostly, I think it's a cliche that sounds good… but like most cliches, if you really think about what it's saying, it's nonsense. That's a good perspective. I do have to remind myself to not get so caught up in the end goal that I forget to enjoy the journey along the way.